Christmas is just around the corner and you can hear the scratching of pen on paper as kids rush to finish their Santa wish lists… Well, not really, since this generation's tech-crazy kids are probably typing out their letters on the laptops they got on their birthdays or Eid or… (who are we kidding, as if they need excuses). So, Santa's sitting down, sorting through all these good kids', bad kids' wish lists and groaning at the growing pile of the latter. At the previous Board of Directors meeting, Santa had been highly criticised by the environmentalist society. 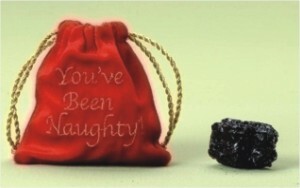 Energy consumption is one of the most pressing issues in the world and Santa was handing out coal, a NON-renewable energy source. What was Santa trying to pull off? It was a fossil fuel. So this year, Santa consulted with his creative elf, Arf, and decided to get more inventive. Tradition was fast fading, and if he couldn't keep up, he'd soon be out of a job. The kids who beg every week for a new game that came out for the PS2/PS3/Wii, screaming and throwing fits when their parents don't get the games for them ASAP. Yeah, they were expecting that awesome game that just came out, after all, they had wished for one of those, and after all the nice things they'd done this year, they expected a return. Scrabble was a word game, and even worse, a BOARD game. What were their parents thinking? How could they? Way to destroy a kid's Christmas. Kids who cheat in class, in exams, in doing their chores, etc. They've cheated their way through school, through the little things they have to do at home, like making the bed or washing the dishes. Well, cheating is a bad thing to do, so these kids are in the coal pile, too. This will leave them with their jaws dropped and eyes twitching. It's an amazing emotional blow and they will know it is a result of their cheating. Emoticon at the end not compulsory. It's simple and effective. When they pull this one out of the stocking or from under the tree, they will look at it and immediately start bawling at the top of their lungs. You just grab the tape and stretch it across their mouths. It should shut them up for awhile, and they will get the message: No more screaming to obtain things. Simple instructions for ready use - Simply stick to child's body, preferably the back where s/he can't reach. Not artists literally, the kids who draw everywhere. They draw on the walls, on chairs, tables, books, you get the picture. If you have ever had these kids come over to your house, you shudder at the nightmarish memory. They always seem to have a marker on them, and they seem to have a sixth sense telling them exactly what you would hate for them to draw on. If you have an 'artistic' sibling, it's worse. Simple, inexpensive and maybe they will get hooked onto drawing with erasers, who knows? (Nah, most people just aren't that lucky, and besides, naughty kids would NEVER do something so non-evil.) Bonus pointer: Buy the dust-free ones. They're cooler. Does this one really need any explanation? Everyone knows what liars are. Kids who steal from other people's houses, from school bags or shoplift. It's a really disgusting habit to steal from anyone other than your friends. Henry Perowne, a neurosurgeon on his day off, mulls over a pleasant family dinner that he has to plan for his family on what should have been an otherwise ordinary Saturday. Thus begins Ian McEwan's 2003 novel Saturday. Henry's Saturday coincides with a massive anti-Iraq war demonstration taking place in London. While he drives across the city, the introspective narrative sprawls into all aspects of Henry's life. He ponders his marriage with his wife, the familial issues with his philandering father-in-law living in France, the withdrawal of his grown-up daughter, and then his unfortunate run-in with an aggressive petty criminal in the alleyways of London. From sun up to sun down, Henry's day seems to encapsulate themes that range from the justification of war to the provision of mental health services to the mentally ill. The entirety of the novel, five hundred-odd pages in all, probes the unfolding of Henry's thoughts. Though limited to only one character's narrative as opposed to other McEwan novels, where the narrator may frequently switch from one character to another the depth to which the reader is taken is extraordinary. 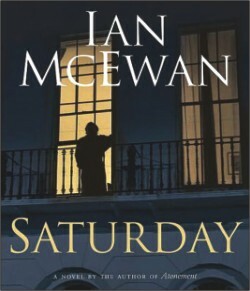 As with other McEwan novels, Saturday lingers over certain details, certain events, while skimming past others. The narrative is not taut. The story takes its time to unfurl. Details of the elaborate meal Henry prepares for his family touches on McEwan's grasp of French culinary practices; the fictionalised anti-war protest creates a platform for what could possibly be McEwan's own views on the Iraq war. McEwan's attention to detail is extraordinary. He delves into aspects of Henry Perowne's life with exceeding clarity. Even the technicalities of Henry's neurological surgery is explored, and with beautiful clarity. The post-9/11 novel - if it may be called so - manages to keep the war in perspective without taking an inflammatory stance. McEwan handles the context of Saturday without preaching from the pulpit. All sentiments expressed, in spite of their controversial origins, are quietly folded into the narrative and woven into the thoughts of the novel's narrative without seeming out of place. Saturday is an amazingly rich read for those who are familiar with McEwan's style and appreciate his particular brand of storytelling. If descriptive writing and occasional lapses into intellectually elevated topics make you cringe, then Saturday is no fluff read. But if you have a Saturday to spare, then this book is for you.